FOOD, NUTRITION AND ANIMAL FEED « Global Market Insights, Inc. 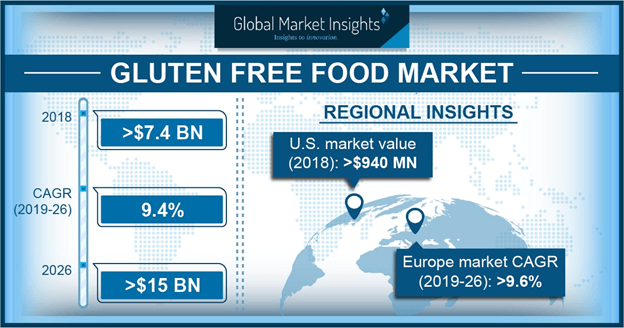 The global gluten free food market has gained remarkable momentum from the fast changing lifestyles and increased consciousness regarding the availability of healthier food options provided by the food and beverages industry. While people are realizing that a gluten free diet results in better living, for people suffering from celiac disease or gluten allergies these food options present a solution to sustain their life. An upsurge in consumer spending across the globe has enabled food companies to delve into the research and development of bakery, snacks and packaged products made without gluten, giving an impulsion to the gluten free food industry. Rising popularity of products made from millet, rice and quinoa to substitute wheat or barley-based food has also outlined the industry penetration. With worldwide revenue surpassing USD 6.5 billion in 2017, the gluten free food market is poised to witness a higher consumption rate over the next few years. Extensive health benefits of gluten free food have been observed to overcome various disorders, especially for people having celiac disease, which is an autoimmune disorder that restricts the processing of proteins present in gluten food. It was estimated that in North America, 1 in every 133 people have celiac disease and in about 5% to 10% of the cases people remain undiagnosed, as sometimes the symptoms do not manifest themselves. People adopting a gluten free diet also experience increased energy, while proven advantages for autism patients has further propagated the gluten free food market. An incidence demonstrated that a child, suffering from severe autism where he could not even speak, was once put on a gluten free and casein free diet. He showed incredible improvements in response to the diet and, albeit untreatable behavioral issues, could then speak and act like any other child not having autism. The obvious significance of a controlled gluten free diet has invigorated the gluten free food market with a renewed dynamism, making packaged and ready to eat gluten free meals available in a vast number of conventional stores and restaurants throughout North America. Consumers are seen buying healthy meals regardless of their economic circumstances if they aim to say in good shape, and the growing shelf space in convenience stores has allowed the influx of new food products. The National Association of Convenience Stores (NACS) in the U.S. had reported that by 31 December 2017 the number of convenience stores in the country had increased to reach a record figure of 154,958. Besides, other conventional stores such as grocery and drug stores also increasingly offer packaged food, which is indicative of a promising income source for the gluten free food industry. According to the NACS, the total number of drug stores in the U.S. were 43,169 by the end of 2017, with store owners focusing more on innovative products and customer satisfaction, giving opportunities to businesses in the ready meals segment. Club stores where members enjoy different offers on food products are also contributing notably towards the gluten free food market, Walmart owned Sam’s Club being a prominent example. The chain has almost 600 clubs in the U.S. and Puerto Rico and had reported earnings of USD 59 billion for the financial year ending 31 January 2018. The company provides consumers with options like gluten free bread, cakes snacks box and several ready meals to keep up with the outpour of demand for health-friendly food. Overall, the USD 378 billion U.S. food industry has played an exceptional role in pushing the gluten free food market expansion by bringing in enhanced meal versions of classic North American recipes. To elaborate, Texas company Cece’s Veggie Co. had recently re-created the macaroni and cheese made with pasta in a product which gluten free and organic, demonstrating the steps toward a healthier future taken by the ready meals segment. Kidfresh from New York has also expanded its frozen meals line by added gluten free food such as mac and cheeses or ham and cheese burritos while TH Foods Inc. has launched gluten free crisps and crackers which are made out of vegetables and cheese. Portions Canada sells No Gluten meals and food ingredients to cater to the growing consumer base in the country. Depicting how the gluten free food industry is reaching consumers through distinct product types, the gluten free ready meal segment is expected to earn over USD 1.5 billion in remuneration by 2024. With the presence of major brands that produce gluten free products such as meals, cakes, breads and cereals, the North America gluten free food market is expected to record a 9.5% CAGR from 2018 to 2024. Kellogg’s, General Mills and Boulder Brands are some key players in the region responsible for promoting the gluten free food industry to millions of conventional store customers and provide effective solutions for maintaining a light and healthy diet. This entry was posted in FOOD, NUTRITION AND ANIMAL FEED and tagged Gluten Free Food Industry, Gluten Free Food Market, Gluten Free Food Market Analysis, Gluten Free Food Market Growth, Gluten Free Food Market Outlook, Gluten Free Food Market Pdf, Gluten Free Food Market Price, Gluten Free Food Market Report, Gluten Free Food Market Share, Gluten Free Food Market Size, Gluten Free Food Market Trends. The global black seed oil market is projected to gain significant momentum in the ensuing years, a feat that can be attributed to the emergence of organic wellness and food products. Known widely as Nigella sativa, black cumin seeds, onion seeds, kalonji, and numerous other names, the product is extracted from the seeds of Nigella sativa, a plant native to southwest Asia. The amber-hued oil finds its primary use in cooking and is said to offer extensive medicinal benefits, in addition to possessing the ability to fight life-threatening diseases. According to a review published in Complementary Therapies in Medicine 2015, black seed oil was claimed to be of importance to people with diabetes. Figures by the World Health Organization revealed that the number of diabetes patients was up by 108 million in 1980 to 422 million in 2014. The global prevalence of this condition among adults above 18 years of age had surged to 8.5% in 2014. In several cases, diabetes leads to major issues like kidney failure, heart attacks, limb amputations, and blindness. In an article by the Journal of Endocrinology and Metabolism, academics from the Indian Council of Medical Research mentioned that black seed oil results in gradual part pancreatic beta-cells raises the lowered serum insulin concentrations and controls glucose levels. It is thus rather discernible that the rising prevalence of diabetes worldwide and the deployment of black seed oil to aid in its treatment will foster the black seed oil market growth from pharmaceutical applications in the years to come. Black seed oil consists of thymoquinone, which is its main active constituent for adjuvants to pharmaceutical cancer treatments. Many studies have displayed the effects of Nigella sativa on numerous cancer cells – indeed, the list offers more than 57 reviewed papers on the effects of black cumin seeds against cancers of blood, lung, skin, cervix, prostate, breast, pancreatic and more. Thymoquinone extracted from Nigella sativa has been examined for its antioxidant, and anticancer properties since 1960 in vitro and vivo models given that the component may behave as superoxide and free radical scavenger compatible with preserving the activity of various antioxidant enzymes. Moreover, black seed oil has also been recommended as an organic radioprotective agent for immunosuppressive and oxidative impacts of ionizing radiation. Based on GLOBOCAN 2018 forecast of cancer incidents and mortality, there will be around 18.1 million new cancer cases and 9.6 million cancer deaths, with lung cancer being the most commonly diagnosed cancer that accounts for 11.6% of the total cases and 18.4% of the total cancer deaths. According to the National Center of Biotechnology Information, a study conducted to test cytotoxicity of black seed oil and its effects against the human lung cancer cell line revealed that it does considerably reduce the viability of lung cancer cells. The abovementioned benefits that can possibly aid cancer prevention, may encourage the consumption of black seed oil capsules among individuals seeking natural remedies, resulting in further expansion of the black seed oil market from pharmaceutical applications. Besides its pharmaceutical benefits, black seed oil is also quite popular in the cosmetic and skin care applications, especially among millennials. Instead of blindly purchasing a product, customers today are inquisitive about the contents in order to avoid chemicals or tests on animals. Currently, the market is observing an increasing demand for cosmetics that are natural and safe. Based on a 2013 study comparing the therapeutic benefits of Nigella sativa with benefits of prescription medications, it was proven that black seed oil can reduce the severity of eczema. Although there is no scientific evidence backing the benefits, black seed oil is also known to soften skin, hydrate hair, and act as a moisturizer. The astringent properties possessed by the ingredient can aid the reduction of impurities on the skin surface. In fact, a study found that lotion with 20% black seed oil is more effective and safer compared to a lotion with 5% benzoyl peroxide in the treatment of mild to moderate acne. The ingredient is commonly found in cosmetic products, which are rapidly growing in popularity due to the presence of organic materials. 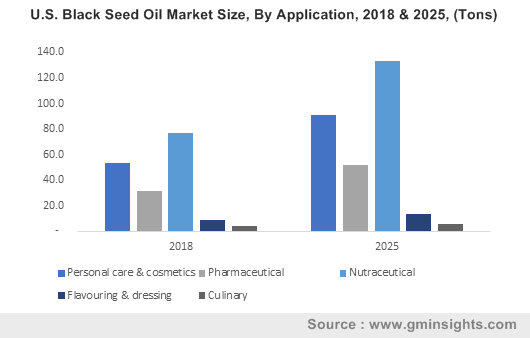 As the demand for natural products increases across the try from cosmetic and personal care as well as pharmaceutical applications, the global black seed oil industry will depict a commendable growth graph in the years ahead. For the record, the overall black seed market size, as per a report published by Global Market Insights, Inc., will exceed $25 million by the end of 2025. This entry was posted in FOOD, NUTRITION AND ANIMAL FEED and tagged APAC Black Seed Oil Market, Black Seed Oil Industry, Black Seed Oil Market, Black Seed Oil Market 2019, Black Seed Oil Market 2025, Black Seed Oil Market forecast, Black Seed Oil Market growth, Black Seed Oil Market outlook, Black Seed Oil Market report, Black Seed Oil Market share, Black Seed Oil Market size, Black Seed Oil Market statistics, Black Seed Oil Market trends, Capsule Black Seed Oil Market., Europe Black Seed Oil Market, U.S. Black Seed Oil Market, World Black Seed Oil Market. The LATAM frozen bakery market, in the recent years, is witnessing a significant growth, given the rapid advancements in the retail space and rising disposable income levels of majority of the population. The robust outbreak of fast food outlets and restaurant chains have further led the LATAM frozen bakery industry to traverse along a lucrative growth graph in the past few years. The overall valuation of the LATAM frozen bakery market hitting USD 4.3 billion in 2017, stands as a valuable substantiation to the fact that this business sphere is to nothing but proliferate in the coming years, with new product launches, rising investment trends, and increasing number of industry magnates’ going the whole hog to establish their stance in this multi-billion-dollar business cosmos. Aryzta, the Swiss-Irish frozen bakery market player, has recently unveiled its plan to build a factory in Brazil, which would manufacture frozen products. It has been reported that the plant would be Aryzta’s fifth in the country and it will be investing 150 million Brazilian real (€33.8m) for the bread making facility. Aryzta is further seen strengthening its ties with the local customers including the food-service outlets of Subway, Burger King, and Starbucks, while it is supplying its frozen bakery products to Prezunic and Walmart in the retail sector. If reports are to be believed, these quick serving restaurants – that forms the important channel for Aryzta – accounts for more than 50% of food-service revenue in Brazil. The aforementioned instance highlights two prominent factors. The first being the expanding investment of the global industry players in LATAM regions for extracting hefty ROI, and the large-scale expansion of the fast food chains such as Subway and Domino’s leading to greater pickup in demand for bread, frozen dough, and viennoiserie. On this note, it is imperative to mention that in terms of recipe, bread accounted for more than 60% if the overall LATAM frozen bakery market share by volume in 2017 and is estimated to cross 63% by 2024. The viennoiserie segment has further locked its prominent industry share in terms of revenue, with valuation exceeding USD 700 million in 2017. Speaking of the robust segment growth, Colombia, the third largest country of Latin America, after Brazil and Mexico, is emerging as the lucrative investment ground for the potential stakeholders, given the positive growth of the fast-food industry. An apt instance bearing testimony to the same is of Grupo Bimbo S.A.B. de C.V., who acquired a Colombian frozen baked food company Panettiere in 2016, in an ambitious attempt to expand its participation in the growing in-store & food service bakery channels in the region. Reports claim that leveraging the company’s product line including ciabatta, baguettes, croissant, flautas, hojaldre (puff pastry), sandwich rolls, muffins and blandito (soft bread), Panettiere will be part of the Bimbo’s LATAM frozen bakery business. Reports further claim that one of the most important factors driving Colombia’s frozen bakery industry is the robust proliferation of the packaged food industry in the last couple of years. In fact, the annual per capita consumption of the processed foods was projected to be more than USD 330 million in 2016, according to the National Association of Colombian Business, while it is prudent to note that the global packaged food sales, is also witnessing a boost, up from the USD 2,348.9 billion in 2014 to a steady growth of USD 2,516.2 billion in 2017. This growth has further the product demand for frozen dough particularly to make burgers breads and pizza base, in turn fueling the LATAM frozen bakery industry growth. Reliable reports claim that, based on the regional landscape of the LATAM frozen bakery market size, Colombia, is estimated to registered a healthy CAGR of 6% over 2018-2024. The development of different retail channels coupled with increasing number of hotels and restaurants leading to significant increase in bakery products demand such as cakes, pastries, and breads, has been attributable to the overall regional growth. The growth of this business is further likely to gain prominence with prominent domestic players including Groupo Bimbo, General Mills, BredenMaster, and Europastry and other international giants investing in the region to have a preferential access to the faring F&B industry within the continent. 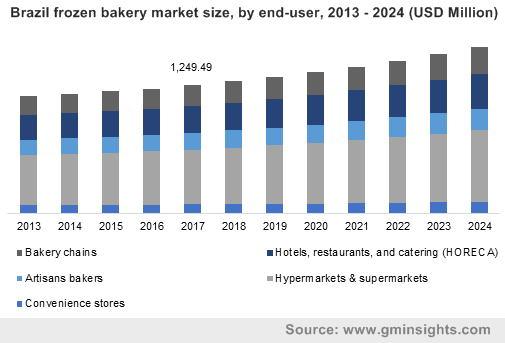 According to Global Market Insights, Inc., the LATAM frozen bakery market is forecast to exceed USD 5.7 billion by 2024. This entry was posted in FOOD, NUTRITION AND ANIMAL FEED and tagged LATAM Frozen Bakery Industry, LATAM Frozen Bakery Market, LATAM Frozen Bakery Market Analysis, LATAM Frozen Bakery Market Growth, LATAM Frozen Bakery Market Outlook, LATAM Frozen Bakery Market Pdf, LATAM Frozen Bakery Market Price, LATAM Frozen Bakery Market Report, LATAM Frozen Bakery Market Share, LATAM Frozen Bakery Market Size, LATAM Frozen Bakery Market Trends. A renowned American aromatherapy and essential oils market player Honé has recently announced that it is proudly taking the concept of aromatherapy several notches up with its all brand new ‘essential oil scented nose diffuser.’ Honé’s introduction of a remarkable and innovative way of reducing unpleasant smell by wearing a discreet nose diffuser has been touted to help the company garner substantial proceeds in the years ahead. For the record, the nose diffuser is an essential oil scented and flexible nose ring designed to prevent odors from entering the nose, while giving a pleasant effect on the users’ mood & daily routine. The company, for its essential oil scented nose diffuser, has launched a campaign to raise crowdfunds on Kickstarter. Another instance worth mentioning is of Airtab, which is a social engagement app, and has recently launched a platform dedicated to mixology events hosted by dōTERRA® Wellness Advocates that will be emphasizing on preparing cocktails infused with essential oils. With all these aforesaid instances in view, it wouldn’t be wrong to quote that the use of essential oils has exploded to new heights in the past few years. The unprecedented surge in product innovation and increasing R&D investment for developing alternative remedies from essential oils have turned this once small-scale business into a multi-billion-dollar industry, with global essential oils market valuation surpassing USD 7.16 billion in 2017. The remarkable industry valuation also throws lights on the growing popularity of essential oils in the cosmetics & toiletries, fragrances, aromatherapy, food & beverage, pharmaceutical, and other sectors. Reliable reports claim that the overall essential oils industry share garnered hefty remuneration from the food & beverage application, given the extensive demand for black pepper, rosemary, clove, orange, lemon, and cinnamon oils for cooking and flavoring cuisines & beverages. Another vital factor driving the demand of essential oils market from the F&B industry is the supportive FDA regulations regarding the approval of natural, plant-based and organic oils, offering antimicrobial and antioxidant properties, for consumption. Analyzing these emerging trends, estimates claim that the global essential oils market from F&B application is projected to surpass 145 kilo tons of demand by 2024. Aromatherapy is forming another lucrative application segment, which is gaining immense traction of late, given the growing population looking for alternative remedial treatments and replacement for pharmaceutical drugs. Rising demand form health conscious consumers for aromatherapy to balance their mental and physical well-being is expected to significantly fuel the product demand. With an estimated valuation of over USD 2.5 billion by 2024, aromatherapy application is expected to be nothing but a profitable growth avenue for essential oils market. Speaking along similar lines, lavender, tea tree, orange, and mint are few among the other popular essential oil products witnessing extensive demand in the recent years. Therapeutic benefits of these oils, have pushed the commercialization matrix of this business space to next level. Say for example, lavender oil has been shown effective in relieving nervous tension and stress to improve productivity. It is moreover being used in combating serious health issues such as chronic anxiety, stress, cancer, and has also proved beneficial in reversing the signs of ageing, headaches, and pain relievers. 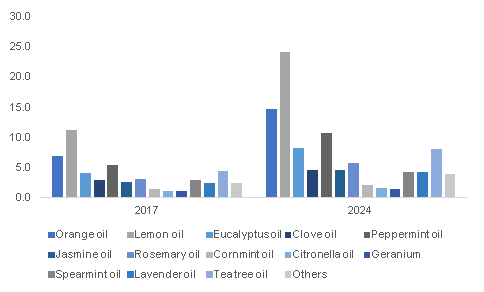 The extensive demand for lavender oils from aromatherapy, pharmaceutical, and cosmetic applications is further expected to stimulate the essential oils market size in the ensuing years. Research reports project the overall lavender oils market to exceed demand of over 20 kilo tons by 2024. This potential growth statistics surrounding the application and product landscape of essential oils industry is indicative of better expansion prospects within the wellness industry. As of now however, though their use is gaining traction, scientific research and development into essential oils are still in the embryonic stages. Growing investment in R&D projects for innovative oil extraction techniques and development of microencapsulation of these products will further have a remarkable influence on the profitability quotient of this business sphere. A presumption bearing testimony to the same is of Global Market Insights, Inc., that claims the global essential oils market to hit a remuneration portfolio of USD 13 billion by 2024. This entry was posted in FOOD, NUTRITION AND ANIMAL FEED and tagged Essential Oils Industry, Essential Oils Market, Essential Oils Market Analysis, Essential Oils Market Growth, Essential Oils Market Outlook, Essential Oils Market Pdf, Essential Oils Market Price, Essential Oils Market Report, Essential Oils Market Share, Essential Oils Market Size, Essential Oils Market Trends. Increasing tea consumption rates & awareness regarding health owing surging chronic disease prevalence is certain to fuel tea polyphenols market trends. Tea is undeniably one of the most popular beverages consumed worldwide due to its anti-inflammatory, antimicrobial, and antineoplastic properties. The product has high epigallocatechin gallate (EGCG), fibers and antioxidants which help increase metabolism and support weight reductions. According to reliable sources, more than 3 billion kilograms of tea is produced and consumed around the world yearly, validating the rising popularity of the beverage, that would consequently impact tea polyphenols industry size. The potential health benefits associated with tea consumption can be partially attributed to the antioxidative property of tea polyphenols. Recent reports suggest that green tea consumed in a balanced diet can improve the overall antioxidative status of the body, as well as protect against oxidative damages. Tea preparation has also been depicted to ambush reactive oxygen species, such as hydroxyl radical, superoxide radical, peroxyl radical, singlet oxygen, nitrogen dioxide, nitric oxide, and peroxynitrite, reducing their damage to lipid membranes, nucleic acids, and proteins. Tea, brewed from the plant Camellia sinensis, is largely consumed in different forms, popular among them being black, green, and Oolong teas. As per a survey conducted nearly a decade back, of the tea produced worldwide, 78% is black tea, which is usually consumed in the Western countries, around 20% is green tea, commonly consumed in Asian countries, and 2% is Oolong tea which is produced mainly in southern China. Indeed, brewed tea contains many polyphenols and other health benefiting compounds – it is thus rather overt that the rising consumption of these health-based teas will have an impact on the overall tea polyphenols market share. Reportedly, studies also suggest that polyphenolic compounds present in tea can effectively reduce the risk of a several diseases that take a heavy toll on the global populace – a fact that would serve to further propel tea polyphenols industry. Many epidemiological studies conducted to investigate the effects of tea consumption on human cancer show an inverse relationship between tea consumption and development of cancer. Reportedly, studies were undertaken on gastrointestinal cancers in China and Japan where green tea is mainly consumed. As per medical reports, individuals who consumed over 10 cups of green tea per day showed remarkable reduction of relative risk for lung, colon, and liver cancers. Further studies in northern Italy have also suggested the protective effects of green tea against oral, pharyngeal and laryngeal cancer. In addition, tea drinking was shown to be associated with a lower risk for digestive and urinary tract cancers in women, with a relatively lower risk for stomach cancer occurrence. Owing to the extensive prevalence of cancer worldwide, green tea is thus expected to be majorly consumed in the years to come. The antioxidants, flavonoids, and catechins present in green tea polyphenols also help reduce the formation of free radicals in the body, protecting cells from skin aging, injury, and even lowering the risk of neurological disorders. The extensive health benefits of these compounds will thus impact green tea polyphenols market size, slated to register a CAGR of 7% over 2018-2024. Asia Pacific tea polyphenols market size driven by China, India, Japan and Australia may register a CAGR of 8.5% over 2018-2024. In fact, India is the largest producer of tea – particularly black tea. With increasing interest in green tea polyphenols however, experts suggest that there is a potential for the India tea industry to enhance green tea production and develop innovative products based on natural tea polyphenols. Reportedly, Indian tea cultivars are currently adopting advance ways such as e-auction platforms to enhance growth of tea polyphenols for industrial exploitation. Indian companies are also looking forward to exporting new types of tea to countries like China where the demand for Indian black tea has been depicting an upsurge. Reports cite that, in 2017, India’s tea exports to China increased by around 30% (approximately 9 million kg) annually, making it a prominent region for the growth of tea polyphenols market. China is also stepping forward as a leading manufacturer and exporter of tea extracts due to constructive government regulations. In 2018, Chinese tea companies were reported to show interest in learning about the e-auction platforms used by companies in India to bring together sellers and buyers online to streamline the marketing of tea. The motive of the initiative was to adopt India’s unique process of the e-auction of tea, so as to expand the two-way trade in tea between the two countries. As per reports, India is cited as the third largest tea exporter to China, led by Iran and Russia. Being a dietary source of biologically nourishing compounds that help prevent a wide range of diseases, health tea is thus experiencing an increase in terms of popularity across the globe. Tea polyphenols contain bioactive compounds, antioxidants, ECGc, and essential nutrients to keep the mind calm and boost metabolism and immunity – factors that would help advance industry growth. 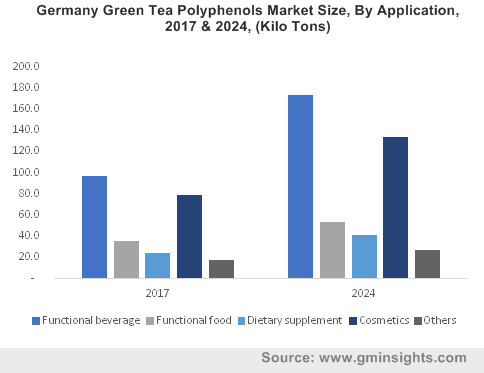 Driven by the advancements in tea cultivation technologies and supportive government regulations, tea polyphenols market size is likely to cross 10 kilo tons by volume by 2024. This entry was posted in FOOD, NUTRITION AND ANIMAL FEED and tagged Tea Polyphenols Industry, Tea Polyphenols Market, Tea Polyphenols Market Analysis, Tea Polyphenols Market Growth, Tea Polyphenols Market Outlook, Tea Polyphenols Market Pdf, Tea Polyphenols Market Price, Tea Polyphenols Market Report, Tea Polyphenols Market Share, Tea Polyphenols Market Size, Tea Polyphenols Market Trends. Increasing demand for high quality meat products, particularly in the economies of China, India and Brazil, is likely to boost feed phytogenics market, driven by the increased demand for livestock production. Phytogenics are known to have a wide range of biologically active properties, such as anti-inflammatory, antioxidative, anti-microbial and digestion-enhancement, beneficial in modern livestock production. These products are used to enhance the performance & health of livestock including ruminants, poultry, swine, and aquatic, basically for meat consumption, the upsurge in which will augment feed phytogenics industry. Reportedly, the meat sector has increased its investments lately so as to meet the surging demand for high protein meat products for health-conscious consumers, and has seemingly switched to ready-to-eat (RTE) meat products due to easy availability, hectic lifestyles, and rising innovations in meat processing technology. Reports suggest that in the 2015, the China’s meat production accounted for 28.4% of the total meat production in the world, while the global meat production stood at 86.25 million tons. 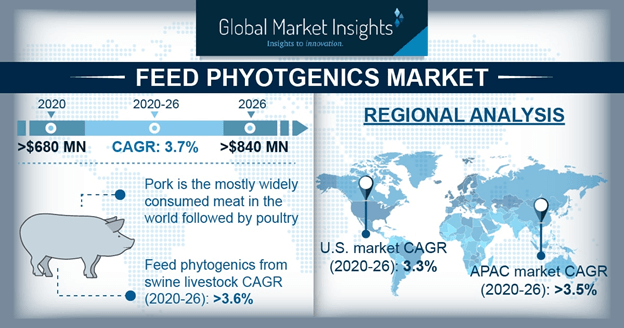 By adopting advanced meat processing technologies and phytogenic feed additives (PFAs), meat industry players are focusing on increasing their output yield, which would quite overtly prove to beneficial for feed phytogenics market. Ideally, PFAs are used in the animal industry is to improve the feed quality as well as animal health and performance. The product is considered as a first alternative to AGP (antibiotic growth promotors), mainly due to its antioxidant, antimicrobial, and anti-inflammatory properties. Most reports speculate an optimistic growth in PFA promoting effects on reproduction of milk, egg, and meat. These products have found wide usage in dairy cow nutrition to enhance the technical properties of milk for cheese and butter production and play a critical role in reacting to a ruminant’s complex digestive and metabolic system. These products also impart anti-oxidative and anti-inflammatory properties to the gastrointestinal tract for the survival of calves. Driven by these incredible benefits, feed phytogenics market is expected to traverse along a positive growth path in the years ahead. Essential oils (EOs) are widely used as PFAs, due to their strong aromatic features and bioactivity. On account of the volatile and reactive nature of EOs, their effectiveness in animals can be influenced by different conditions during production processes, storage of EOs, and conditions in the gastrointestinal tract of the animals. Evidence suggest that PFAs containing more volume of essential oils can minimize the environmental impact of livestock industry on the atmosphere by reducing emissions of ammonia from pig production, and methane from fermentation in the rumen. Moreover, these products can increase the absorption of amylase and other endogenous enzymes, further increasing the commercialization potential of EO-based feed phytogenics market. The use of EO-based PFAs offers several benefits to producers, including enhanced animal performance, improved feed efficiency and reduced emissions. According to reports from the animal health and nutrition company, BIOMIN, the overall phytogenic feed additives sector alone is likely to become a billion-dollar industry by 2030. A report from Global Market Insights, Inc., claims essential oils-based feed phytogenics industry size to surpass USD 380 million by 2024. China is one of the largest beef and sheep meat producers and consumers across the globe. In 2015, the country’s sheep meat production was reported at 4.41 million tons, accounting around 30% of the world’s total sheep meat production, while beef production was reported at 7 million tons, accounting for 10.4% of the global yield, eventually making China as the world’s 3rd largest beef meat producer after Brazil and the United States. Reportedly, steady domestic prices have attracted investment into cattle farming in the region. Experts suggest that the surge in purchases of meat products by Chinese consumers is expected to remain the main factor driving the China feed phytogenics market in the future. Indeed, China feed phytogenics market size, as per estimates, is forecast to exceed USD 50 million by 2024. Highly appreciable benefits of feed phytogenics include, increased growth performance, digestion stimulation, increased feed intake, reduced diarrhea prevalence, improvement in reproductive system and feed efficiency. 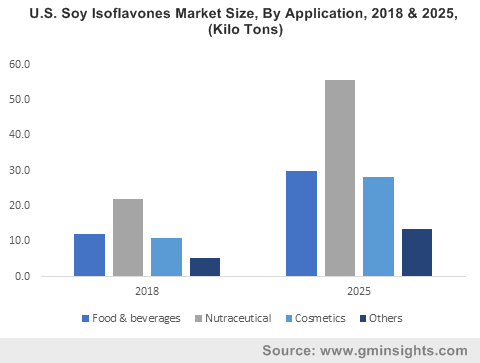 Quite overtly, the growing occurrence of diseases, rising consumption of meat and increasing healthcare regulations on the usage of antibiotics in animal feed will augment the growth of feed phytogenics market size. This entry was posted in FOOD, NUTRITION AND ANIMAL FEED and tagged Feed Phytogenics Industry, Feed Phytogenics Market, Feed Phytogenics Market Analysis, Feed Phytogenics Market Growth, Feed Phytogenics Market Outlook, Feed Phytogenics Market Pdf, Feed Phytogenics Market Price, Feed Phytogenics Market Report, Feed Phytogenics Market Share, Feed phytogenics market size, Feed Phytogenics Market Trends.